Most you know I pretty much just lay around the courtyard thinking about what to blog next, but my friend Nigel loves to go walking with the guests at the Inn Above Onion Creek. I've been told that Nigel will even go as far as informing guests with a polite meow that they are headed the wrong direction. He's the official tour guide of the hiking trails here at our bed and breakfast. 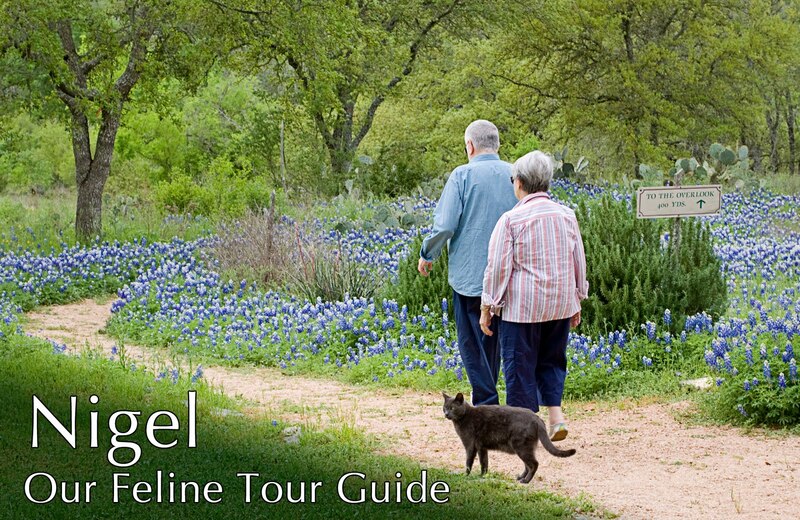 Be sure and take a hike on our miles of trails during your next hill country vacation at the Inn Above Onion Creek. Oh, how I would like to be there right this minute!! Nigel is adorable and I love walking along the country hill side, it gives me a feeling of peace and serenity and makes for an active lifestyle as well.